This helps your student’s transition to cursive penmanship much easier. The BJU Press Handwriting 1 Student Worktext is one of our favorites as a first homeschool penmanship book. Here’s another one of our favorites! The new third edition of the Bob Jones Handwriting 1 Student Worktext has made a remarkably homeschool friendly introductory penmanship course. Though it is listed for grade 1, this consumable workbook could be used with any child who needs to learn to print neatly and isn’t ready for cursive. BJU Press has their own pre-cursive style which keeps the student’s pencil on the paper (unlike the “ball and stick” method) It is a bit slanted, and has a more natural curve to the letters. For example, when you end the a, there is a little curve at the end instead of the straight stick look. The workbook has 330 pages consisting of 165 two-page lessons. Once again, like their new kindergarten math, the page layout and the graphics are well done. There is enough practice on each page to be beneficial without giving your student blisters on the fingers. This is the kind of curriculum product we love because it is economical and easy for the busy homeschool mom (or dad!) to use. In the homeschool setting with one on one instant feedback and reinforcement, you could really use this as your manuscript printing curriculum and then move on to cursive–especially with the late bloomers. See Thoughts on Teaching Handwriting for more information about teaching penmanship to the homeschooled child. Teaches both the precursive and cursive alphabet. Consumable. 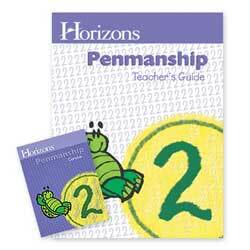 Handwriting Kit 4 (Teacher’s Edition and Student Worktext) 2nd Ed. Calligraphy Pen-Chisel-point pen needed for the calligraphy lessons.